"The Global Community is defined as being all that exits or occurs at any location at any time between the Ozone layer above and the core of the planet below. It is defined around a given territory, that territory being the planet as a whole, as well as a specific population, which is all life forms on Earth." This definition includes all people, all life on Earth. And life claims its birthright of ownership of Earth, and so does the Soul of all Life. That makes the Global Community the 21st century framework for Earth governance, and the only legitimate body with the power to make the laws of the land and to make the rules for the territory of the Earth. The Scale of Global Rights contains six (6) sections. Section 1 has more importance than all other sections below, and so on. Concerning Sections 1, 2, and 3, it shall be the Global Community highest priority to guarantee these rights to Member Nations and to have proper legislation and implement and enforce global law as described in Global Parliament Constitution. safety and security, have shelter, 'clean' energy, a 'clean' and healthy, environment, drink fresh water, breath clean air, eat a balance diet, basic clothing, universal health care and education, and employment for all. Section 3. Global [ecological, environmental, protection of life-support systems ] rights and the primordial human rights of future generations. Concerning Sections 4, 5 and 6, it shall be the aim of the Global Community to secure these other rights for all global citizens but without immediate guarantee of universal achievement and enforcement. These rights are defined as Directive Principles, obligating the Global Community to pursue every reasonable means for universal realization and implementation. Section 4. Community rights, the rights of direct democracy and global voting, the right that the greatest number of people has by virtue of its number (50% plus one) and after voting representatives democratically. Section 5. Economic rights (business and consumer rights, and their responsibilities and accountabilities) and social rights (civil and political rights). Section 6. Cultural rights and religious rights. Now, obviously what immigration does is to infringe into the most important rights on the Scale of Global Rights: Sections 1, 2, and 3. It amounts at creating the world overpopulation problem which is way far more destructive than conducting military warfare. The Global Community condemns all types of warfare we see in the world today: military, economic and population. Surely the rights to protect the existence of all life on our planet are more important than cultural and religious rights. Earth Environmental Governance can only be achieved successfully within the larger context of Sustainable Development and Earth Management. All aspects are inter-related and affect one another. A healthy environment is essential to long term prosperity and well-being of Global Community citizens. That demands a high level of ecological protection. This is the 'raison d'etre' of the Scale of Global Rights. Primordial human rights are those human rights that individuals have by virtue of their very existence as human beings: to live, eat, drink fresh water, breath clean air, have shelter, safety and security, 'clean' energy, a 'clean' and healthy environment, universal health care and education, and employment for all. Ecological and primordial human rights are separate categories than the rights of the greatest number of people, economic rights, social rights, cultural rights and religious rights. Ecological and primordial human rights are the only rights that have existed unchanged throughout the evolutionary origin of our species. Any major change would have threatened our very existence. All other human rights are rights created by human beings and can be changed depending of new circumstances; they are not stagnant but are rather flexible and adaptive, and they can evolve. Ecological and primordial human rights of this generation and of future generations are therefore much more important than any other human rights existing now and in the future. In this way the Scale of Global Rights gives us a sense of direction for future planning and managing of the Earth. Earth management is now well defined and becomes a goal to achieve. Earth management includes problems with immigration in the world. We have shown that all aspects are inter-related and affect one another. Population warfare amounts to increasing demands for more resources but nations are already fighting for what is left of natural resources on the planet. Today, we need five healthy Earths to feed the world population. And population warfare also amounts to a specific cultural or religious group of a population trying to gain control of a nation by increasing its size and affecting the political outcomes of government in power. All about control! A working Global Parliament Constitution is the only way for us all to guarantee essential services, Justice, and protection to every home. Global Parliament is not a World Government or Earth Government. No! It is the Federation of Global Governments. Global Parliament and its Constitution were researched and developed from fundamental principles as opposed to kitchen recipe types of Constitution that follow a set of instructions for a world parliament of some kind. Some of those principles we developed are the Global Community and the Scale of Global Rights. That is was what differentiate our proposal from others. The Federation and its Global Parliament operate as per those principles. The definition of the Global Community concept is truly the 21st century "philosophy of life" framework, some called it the religion of the third millennium, others called it the politics of the future generations now. First, participating member nations need to give their approval to the GPA. The GPA is a global organization much like the World Trade Organization (WTO) for trade between nations, the World Health Organization (WHO) for health, or the European Union, North American Free Trade Agreement (NAFTA), South American Community of Nations (SACON) for trade and economics. The GPA offers an efficient emergency response to help. The GPA is a short term solution, an immediate and efficient response to help. There are also long term solutions. As with the short term solution, the most significant long term solution is also related to the Scale of Global Rights. The Scale was entrenched is Global Parliament Constitution and is thus the fundamental guide to Global Law. Now the Scale of Global Rights is a long term solution and is also a part of the Global Movement to Help of the Global Community. The Scale was designed to help all life on Earth. What would be preferable is that nations unite amongst themselves to help. And that is our reason for proposing the formation of the Federation of Global Governments. The Global Community offers a more meaningful union in the form of nine or more Global Governments. For instance the South American Community of Nations can be a Global Government by simply accepting Global Parliament's Constitution as a way of dealing between member nations. A Global Government is concerned not only with economics and trade, but also with the environment, health, agriculture, education, energy, food, social, cultural and many other essential aspects. The very first step of Global Parliament, and maybe the only one for several decades ahead of us, would be the approval of essential services amongst the participating member nations. The Global Community has researched and developed such services and listed them here. All of them are already in operation on a small scale. We want each Global Government to take a larger share of responsibility of the specific region where it operates, and be more accountable to the people of that region. And we want a Global Government to be made of wealthy nations as well as nations in need of help. Be compassionate. Each Global Government is obliged to offer Essential Services to the people of its member nations. Over the past several decades, the Global Community along with Global Parliament, have promoted a just and fair global government. The United Nations (UN) organization does not offer such global service to all Peoples. It is not a government. It is not a democratic institution. It has no power to legislate, protect and offer essential services. There is no Justice possible coming from the UN. The Five Permanents Members are the only rule of law. There are themselves subsidized by corporate rulers, lobbyists with vested interests in keeping things the way they are now. There are no change in sight because they cannot change themselves. We must let go the UN. It is a 20th Century WWII organization that can truly make things work for only 5% of the world nations. Staying with the UN certainly means there will not be a 22nd Century to live for most people on Earth. The world needs a 21st Century organization able to manage Earth and bring hope in every home. Global Parliament is the only possible and practical solution to our world. We know how everything work, and we know what to do to make it work for us all. We do volunteer work for humanity. We do 'soft activism' work. Global Parliament Constitution shows us how to operate our organization. We follow Global Law as shown in the Constitution. All those who do volunteer work for us must become familliar with it and become 'global citizens'. You are required to read about the Criteria of the Global Community Citizenship. Once you are sure you understand the Criteria, then you are required to live a life as per the Criteria. You do not need to let go the citizenship you already have. No! You can still be a citizen of any nation on Earth. But you are a better human being as you belong also to the Global Community, and you have now higher values to live a life, to sustain yourself and all life on the planet. We do not relate in any way with the United Nations. We are here to replace it. For several decades the Global Community has tried very hard to reform the United Nations. It has become clear that the United Nations promotes a culture of waste, mismanagement and corruption, and that it cannot reform itself. Today, the only logical, most equitable and sustainable alternative, is to replace it with the Global Community. The Scale of Global Rights is our fundamental principle for development. In today's affairs a very powerful few are in possession of the Earth's resources, the land and all its riches, and all the franchises and other privileges that yield a return. These few people operate virtually without taxation. Is that what we want as a global democracy? Who should own the Earth? Soveveignty is the status of a person or group of persons having supreme and independent political authority. The concept of sovereignty is related to the concept of power: power over a territory, land and water, oil and minerals, as well as life on Earth. The United Nations (UN) cannot have normal attributes of sovereignty, which has been defined around a territory and population. The Global Community has in fact been defined around a given territory, that territory being the planet as a whole, as well as a specific population, which is the Global Community. The issue here is not that of populations and boundary lines, but of the demarcation of power and control over the Earth that is the foremost formal attribute of sovereignty. To speak of enforceable global law is to speak of world power. Global Parliament has the power to make the laws of the land and to make the rules for the territory of the Earth. Global Law has been and continue to be researched and developed for this purpose. Today's problem is that democracy has not grounded itself. We have not extended democratic principles to the ownership and control of the Earth. The democratic global government as currently proposed by the Global Community, is grounded in equal rights to the Earth, and thus can create the world of peace and justice that we seek. Conservation, restoration, and rational use of the Earth resources is about asking ourselves the question of "Who owns the Earth?" The large gap between rich and poor is conected to ownership and control of the planet's land and of all other Earth natural resources. This causes a fundamental threat to democracy. What has become of democracy? What has become "we the people? We need to take a giant step forward to a new form of democracy. We, the Global Community, must now direct the wealth of the world towards the building of local-to-global economic democracies in order to meet the needs for food, shelter, healthcare, education, and employment for all. The Global Community has proposed a new democratic mandate recognizing that the gifts of nature - the land, oil, minerals, other natural resources and a substantial amount of the monetary value accruing to their use - rightly belong to the Global Community. The Earth is our birthright and our common heritage. What we make from our mental and physical labor can rightfully be held as individual property but the profit of the Earth should be shared by all and for all.The unjust and inequitable ownership and control of vast amounts of the land and of other natural resource wealth of our planet is also a root cause of the great majority of local-to-global conflicts and wars. Our current form of democratic governance is severely limited in its capacity to negotiate peaceful means of resolving resource inequities and disputes, whether over oil and other minerals or over land for housing and livelihoods. On the global level the Law of the Seas Covenant is an example of a ground rent basis for public needs as it has affirmed that ocean resources are the common heritage of all and a proper source of funding for global institutions. Water belongs to the Earth and all species and is sacred to life therefore, the world’s water must be conserved, reclaimed and protected for all future generations and its natural patterns respected. The theme of this Global Dialogue being "The planet-Life-Soul of Humanity symbiotical relationship", we will see how the relationship can help this generation of young people and the next ones to remain healthy. The young people of to-day are interested in all the secret wisdom behind all the existing religions and sifting out the common truths. They seek the best of the best. They are aware of the Soul of Humanity and have established a spiritual symbiotical relationship with it, and thus with God. They seek the exaltation and merging of their Souls into one to gain strength, friendship, creativity, love and light. They are educated to understand a broad panorama of human truths ~ all those universal needs and rights every one shares. The Scale of Human and Earth Rights has become an inner truth and the benchmark of the millennium in how they see all values. The Earth Court of Justice brings security, peace and justice for all. They no longer fear the unknown as Justice is for everyone and is everywhere, a universal constant. The Global Justice Movement for all life is now driven by these young people. Each and every Self is dedicated to an idea for good that others can share together in creating this new Eden. Doing good and the well-being of the "other" have become the basic building block of any symbiotical relationship. What we have here is the birth of genuine group concern and unconditional support for the individual's well-being ~ a giant leap in human behaviour which could well change the functioning of global communities everywhere. We are becoming the human family. This new "philosophy of life" of the Global Community has made grounds in people's way of life. However, we have reached the deplorable circumstance where in large measure a very powerful few are in possession of the Earth's resources, the land and all its riches, and all the franchises and other privileges that yield a return. These monopolistic positions are kept by a handful of men who are maintained virtually without taxation. How the Earth should be owned is the major economic question of this time. The world should be owned by the people living in it. The rate of world population growth is beginning to decline, but the total number of people could still double or even triple from today's 6.3 billion before stabilizing a century or more from now. Women in most countries are still having more than the two-child average consistent with a stable population size. Moreover, so many young people are now entering or moving through their childbearing years that even a two-child average would still boost population size for a few decades until the momentum of past growth subsides. Yet there is reason for optimism. The combination of access to family planning and other reproductive health services, education for girls and economic opportunity for women could lower birthrates enough to stabilize world population well before a doubling of today's total. Motivation, rather than differential access to modern contraception is a major determinant of fertility. Individuals frequently respond to scarcity by having fewer children, and to perceived improved economic opportunity by having more children. Economic development does not cause family size to shrink; rather, at every point where serious economic opportunity beckons, family size preferences expand. The need is not to control population growth. Governments cannot control childbearing and attempts to do so have sometimes led to coercive approaches to reproduction that violate human rights. The need is rather to expand the power individuals have over their own lives, especially by enabling them to choose how many children to have and when to have them. Investing in education for girls helps them to contribute to their national economies and to postpone childbearing until they are ready for a family. Providing credit and other economic opportunities for women creates alternatives to early and frequent childbearing. Finally, better access to quality reproductive health services directly benefits women and their families. These approaches increase human capacity, providing the greatest long-term return to societies, individuals and the environment. Moreover, they are likely to lead to an early peak in world population next century. Comprehensive population policies are an essential element in a global development strategy that combines access to reproductive health services, education and economic opportunities, improved energy and natural resource technologies, and to healthyer models of consumption and the good life. Global Dialogue 2009 will therefore have a major focus on such global development strategy, and building global communities for all life on Earth being the final result and objective. 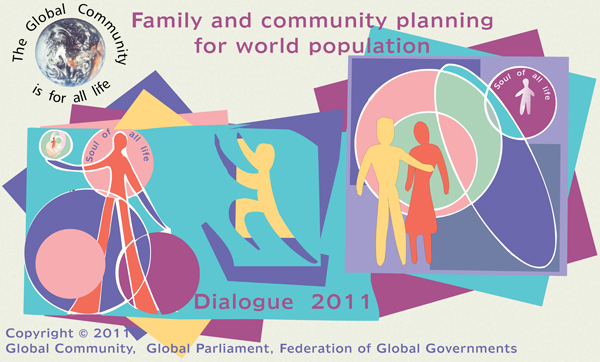 Issues from previous Global Dialogues are included as issues of Global Dialogue 2011. You may also participate in editing the 28 Chapters and Preamble of the Global Constitution. So far,	throughout the year 2006, we have accomplished an enormous amount of work all of which to the benefit of humanity. Global Dialogue 2006 has been a success of great work and co-operation amongst all Global Community citizens from 130 Nations. The approval of the Global Constitution by Global Parliament will benefit us all in the decades to come. A) Send us your own short version of the Global Constitution. It has to be developed from the actual longer version approved by Global Parliament. B) Send us your own short version of the proposed Global Citizens Rights, Responsibility and Accountability Act It has to be developed from the actual longer version. Depending on the level of participation, we may have different categories for these special projects. During the Ceremonies of Global Dialogue 2011, a special Award will be given to the group with the best short version.